Woodland wonder PLUS Joules giveaway WINNERS! Hello October, you sneaked in quickly when I wasn't looking - how did that happen? 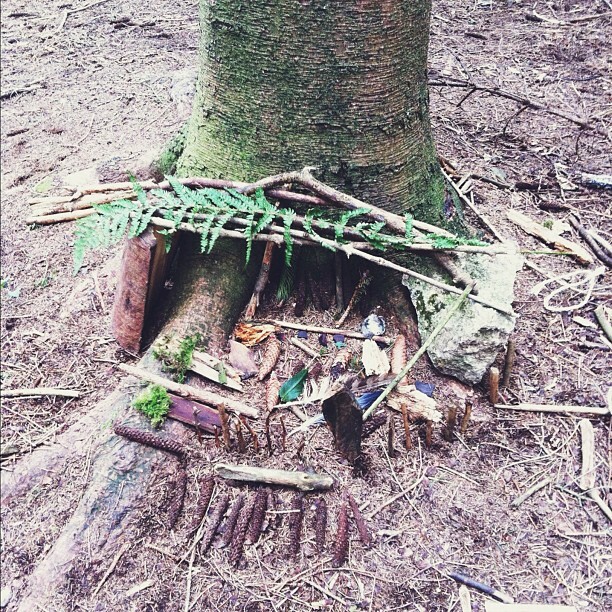 The beautiful abode above is a fairy dwelling, fashioned from twigs, leaves and pine cones, one of the activities from a rather lovely 6th birthday party we went to this weekend. Usually, I'm guilty of a weekend potter - in the house, venturing to the local shops, spending weekends close to home. So when we're invited out of the city it feels like such an adventure. As A put it the night before, "We're going den-building? And marshmallow-toasting? In the COUNTRYSIDE?". He was very excited indeed. And it was very lovely indeed. Especially the marshmallow bit. Well done, you lucky lot. Please drop me an email with your contact details and I'll get your journal to you ASAP. Thrifty Style: Review and GIVEAWAY!